Congratulations are in order for a long-standing Covington business. Steffen's Rental, located on Pike Street, is the recipient of the President's Image Award from the American Rental Association. The honor goes to a business facility or store in celebration of a commitment to improving the rental industry image through a remodeling, rebuilding, or renovation project. Steffen's was honored as the Region 5 recipient (there are 6 regions) and will receive the award at The Rental Show 2015 in New Orleans. The River City News profiled Steffen's in July as the company experienced a transition in leadership after longtime president Jerry Steffen began to battle Alzheimer's. Jerry's daughters now run the business and Arden Steffen is president. The modernization of the building and operations is what got the attention of the national industry and also scored Steffen's a feature story in a trade publication, which documents the update of the operations from carbon-copy contracts to a new computer system, and a new, updated showroom. The article also profiles how the Steffen family has turned the Alzheimer's story into a positive. “Alzheimer’s is such a devastating disease. My family likely has the genetic link for this disease, and many of them may be carriers of it, especially since my father’s mother and various other family members have suffered from its awful fate,” Arden says. “We have been fundraising for the Alzheimer’s Association for a long time. I reached out to the association when my father was diagnosed. I knew that my sisters and I needed help. For some time, we had wanted to sponsor their main walk here in Cincinnati. We were able to be one of the main sponsors for its walk on Oct. 4. All of the staff here knew of our involvement with the walk and were supportive of our efforts,” she says. As Arden and her family were preparing for the walk, one of her employees suggested painting the outside wall of the office at the Florence location the official Alzheimer’s Association color of purple as a way to support Arden’s father and the company’s support of the walk. “We said, 'Sure,' so we have a purple wall with the Alzheimer’s Association banner on it,” she says. Then another employee suggested painting a piece of equipment for the Alzheimer’s Association walk. “I thought that was great. We contacted the Alzheimer’s Association to see whether this would be OK. They said, 'Yes,'” Arden says. 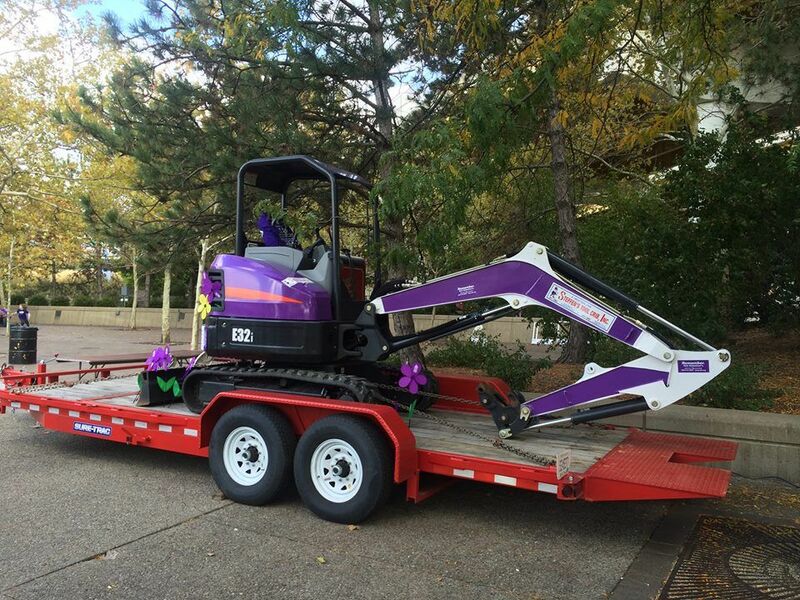 Her uncle, Mark, had arranged for an outside person to paint one of their excavators purple, but that fell through. One of Steffen’s employees came to the rescue. “Joe Watkins, one of our mechanics at the Florence location, decided to take it on himself. He took the entire machine apart and painted the whole thing. He worked down to the wire, painting until 11 p.m. the night before the walk. It is beautiful. My uncle and I delivered it to the site the morning of the walk and announced that 10 percent of any rentals of that excavator would go back to the Alzheimer’s Association,” Arden says. Seeing that purple excavator at the walk was inspiring, Arden says. “Everybody who came together to make this happen, well, it’s overwhelming. It’s a true testament to my father and the impact that he had on our employees. Seeing it at the walk was really therapeutic for all of us,” she says. For Arden and her family, the last few years have been very difficult, but the support from her family, employees and customers has offered tremendous solace. “Tragedy can strike at any point. You can’t prepare for it, but you can take a tragedy and turn it into something positive. The purple wall at our Florence location and the purple excavator that is going out on rent and providing funds for the Alzheimer’s Association are significant positives that show how much people care,” she says. To support the efforts of the Alzheimer’s Association, go to www.alz.org. The Steffen's property is also part of what could Downtown Covington's largest development yet.